Ace test anxiety the Natural Way! How has A+ TestCalmer helped others? How do I use A+ TestCalmer? Common ‘butterflies’ and self-doubt before and during times of written or oral speaking, test taking or exams happens to many of us, sometimes in situations where performance really counts. While it's pretty normal to feel a little nervous and ‘stressed out’ beforehand, for some people, these common ‘jitters’ can sometimes affect performance... even when they are well prepared. This can be very discouraging! A student or learner may suddenly ‘go blank’ during an exam or test – with disastrous results! Taking a holistic approach to health will inevitably show in your academic success. There are tips to overcome test ‘jitters’ in students. Staying healthy by exercising regularly, eating nutritious meals and snacks, and getting sufficient sleep will help maintain the health and vitality of your brain and nervous system, allowing you to function at peak performance. Natural remedies have been used in traditional medicine for thousands of years to help the brain and nervous system to cope with stress and nerves - while still remaining able to concentrate and focus. A+ TestCalmer is a complex remedy incorporating both herbal and homeopathic ingredients in a convenient liquid tincture form. This remedy is for children and teenagers and is formulated to promote calmness and confidence before and during tests and exams without sacrificing mental alertness. 'Nerves' can negatively affect academic performance and even cause physical complaints like headache and stomach ache. Many over the counter remedies which promote relaxation can also affect concentration or induce drowsiness - the last thing a child needs in a test situation! 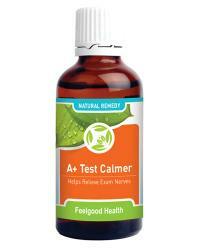 A+ TestCalmer is a 100% safe and effective natural remedy for young people who tend to worry a lot about tests. Although it has excellent calming properties, A+ TestCalmer will not cause drowsiness or adversely affect concentration in any way - allowing the test taker to remain calm and focused. Like all Feelgood Health products, A+ TestCalmer is developed with care by our practising Clinical Psychologist, is 100% natural and manufactured according to the highest pharmaceutical standards. Individual ingredients are well-researched and have been specially chosen for their high safety profile in remedies for children and adolescents. Passiflora incarnata (Passion Flower) is used as a natural calming remedy which acts as a safe, soothing and non-addictive nerve tonic. Rosmarinus officinalis (Rosemary) is well-known as a general tonic and energizer. This herb is also excellent for improving academic performance and supporting healthy memory functioning during tests. Rosemary is known to promote healthy cerebral blood flow and cognitive functioning. Recent studies have found that Rosemary contains acetyl-cholinesterase inhibitors, chemicals that prevent the breakdown of acetylcholine in the brain. Acetylcholine is a chemical in the brain that promotes memory function. A deficiency in acetylcholine has been linked to memory impairment. Centella asiatica is found in Africa and Asia and is a favourite food of elephants. As they say - elephants never forget! This herb is used to re-vitalize the brain and nervous system and improve circulation to all areas of the body. Research has demonstrated the beneficial effect of Centella asiatica on maintaining healthy memory, concentration and mental performance levels, making it an excellent supplement for students and scholars, especially when faced with tests and exams. Centella asiatica is also very effective in promoting calmness and peace. Anacardium (6C) is a homeopathic ingredient most useful for stress and nerves in children and in those who lack self confidence. Anacardium can be very successful in treating a feeling of inadequacy and an irrational fear of failure. Gelsemium (6C) is an excellent homeopathic remedy for stage-fright before an interview or public performance or nerves in anticipation of a stressful event like a test. This remedy is also useful for treating the physical manifestations of nervousness, including trembling, excessive perspiration, stomach upsets and nausea. Gelsemium is said to prevent mental dullness and the mind going “blank” due to anxiety. Contains less than 1% pure pharmaceutical grade ethanol when diluted as directed. Take 10 - 15 drops in approx. 1/4 glass water or juice when necessary. May be repeated after three hours if needed. Safety during pregnancy and nursing has not been established. Not recommended for children under 6 years. Note: Recommended for use along with StudyPlus capsules. The calming and focusing effects of A+ TestCalmer will be noticeable within several minutes of taking the remedy. One 50 ml bottle will last approximately 30 days if taken on a regular, daily basis but will last longer with normal usage. In compliance with Health Department regulations, Feelgood Health does not make any medical claims that its products, including Chikkie Spot Drops, are intended to diagnose, cure, treat or prevent any disease, including chicken pox. Please note that the information on this website is offered for educational purposes only and is not intended to be a substitute for professional medical attention. When in doubt, please consult your health practitioner. It’s normal for anyone to feel a bit nervous or anxious about an upcoming test or other stress-inducing event. For many, speaking in front of a group or class is the most anxiety-inducing activity imaginable! For others, written tests might be the worst. A little bit of nervous tension can actually encourage peak performance when it comes to the actual event, but too much stress or anxiety will interfere with concentration, memory and performance. Nervousness about a test may also cause physical symptoms like an uneasy feeling of "butterflies" in the stomach, digestive troubles like nausea and diarrhea or tension headaches. Many people experience sweatiness, trembling and even heart palpitations as the test or oral task approaches. Take advantage of normal stress to motivate early preparation for a test. Reacting in a pro-active and positive way to anxiety will decrease stress and improve confidence. Have your child speak about their feelings and anxiety; either with you, a teacher, tutor or school guidance counsellor. Many students find that good preparation for tests done well in advance (rather than the night before!) will reduce their anxiety and feelings of panic. A student who has prepared well and knows the material will feel more confident and will often only experience mild nerves before a test. Think positive! Anyone who continuously thinks negative thoughts like “I’m never any good at tests” or “I just know I’m going to fail” will make themselves feel worse and increase anxiety and a feeling of helplessness. Positive messages from teachers and parents as well as in your child’s own thoughts will improve confidence. Encourage your child to replace negative messages with “I’ve worked hard and will do my best” or similar thoughts. Remember and remind your child that nobody is perfect! Almost everyone will have failed at something in their life and most people have struggled with a problem during a test that seemed so easy or obvious afterwards. The trick for your child is not to let every mistake get him/her down - next time is a brand new opportunity to do well! Relaxation methods like breathing deeply, doing a creative hobby or exercising between study sessions will help a lot to decrease stress and anxiety. See 'The Calm Within' relaxation CD compiled by our Clinical Psychologist. A+ TestCalmer has reduced the pre-test panic in my household tremendously. Both of my children have anxious natures and when there are upcoming school tests the stress levels in our household run very high! This natural remedy has been wonderful - it helps to calm them down and their grades have even improved! I will be ordering from you again.